There's plenty of time for fancy colour coordinated Christmas trees before you have children or when they're grownup. In the meantime, you should be ready for homemade decorations. They become part of your family's individuality and little hands will enjoy hanging them on the branches year after year. Salt dough is simple and cheap to make and ideal for modelling into Chistmas tree decorations. 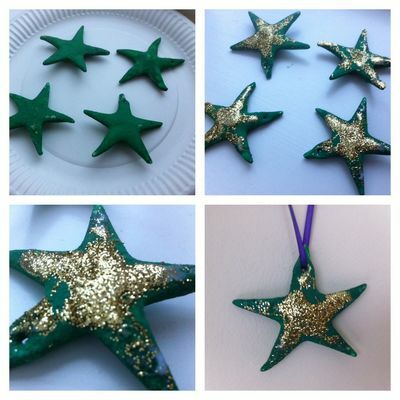 Here's how to make some sparkly stars. There are various steps involved so you can stretch this out over several days or do it in a concentrated period of time depending on how engaged your kids are. Cut stars from the dough with a pastry cutter & pierce a hole for hanging up. Microwave for 1 minute on medium high. Repeat if your stars need a little longer. This will depend on how thick they are. Alternatively you can bake them in the oven for 2-3 hours on a low heat (50 degrees C) or leave to air dry in a warm room over a couple of days. Once dry, thread through a piece of ribbon or thread and tie so that your child can hang on the Christmas tree.